Hello from the wilds of fifth grade. Here, we have finished our P42V Unit (poems for two voices), which started with the study and performance of Paul Fleischman's masterly insect poems from Joyful Noise and culminated in the writing of our own poems. 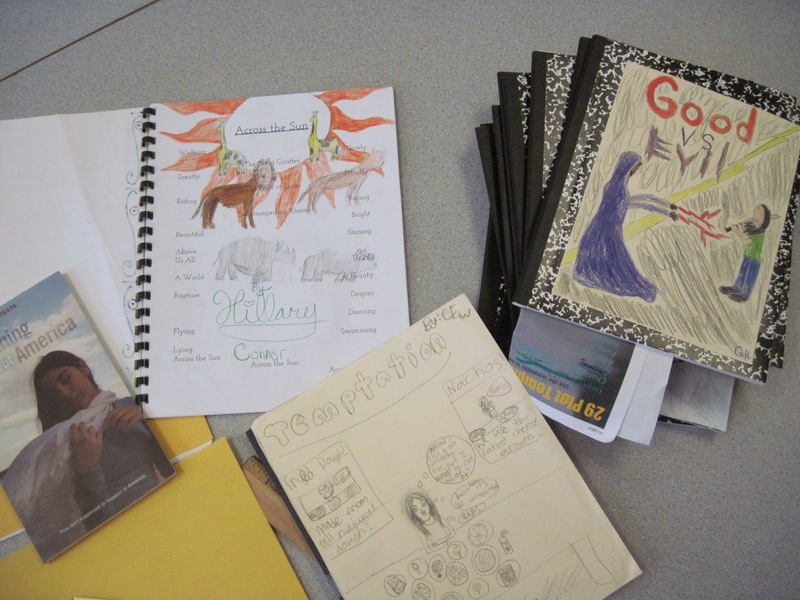 The students chose their best ones to illustrate and include in the anthology. The color one will reside in room 104, but each poet brought a copy home. Ask to see it! On a luddite note: spiral bounding proved quite fun. Ask your poet about the bone crunching sound that big machine makes. It's hard to capture all we do in a period. We always start with a warm-up, which is anything word related...calisthenics for the verbal parts of our brains! Then, we have NQQ - Notes, Quotes, & Questions, during which each student shares a note, a quote, a question...and, not infrequently, a personal writing project. I am with my tribe! We seem to also have a bunch of artists present. They've helped to illustrate the covers for the THEME notebooks I shall be using with all grades: what is literature ABOUT? How does it help us become more fully us? In the picture, you will also see Maria Testa's lovely book in verse, Something About America, It tells an immigrant story and is set in Maine. What does it mean to emigrate? What if you have to flee? What does it mean to be American? We'll be reading this after our break. I also see these students for Worldly Wise 7 vocabulary and spelling extensions. It's an honor to spend time with students for whom this is a serious undertaking. More news forthcoming after the break. We started our year with metaphor and haiku, and will spend some time curating HMS's brand new (not yet revealed) Haiku Shrine (a cousin of the Poem Booth's). Ask your student if you want more information on this!